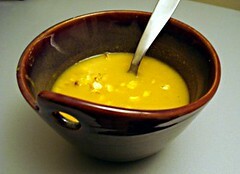 Great fall food: pumpkin and corn soup | Mmm, Tasty! Rich recently found this soup via a link from slashfood, and immediately decided we should try making it. It was very easy to make, and quite delicious indeed. As the original author mentions, any sort of pumpkin or winter squash will do with this recipe; we opted for some of the butternut squash we found at our local Superstore. We also left out the chipotle pepper, because we would never end up using the remaining peppers in the jar before they went bad. Instead, we sprinkled in some red pepper flakes to give the soup a bit of a kick. I assume the chipotle peppers would give more smokey flavour to the soup, but it was great without them.